Saw these in the grocery store yesterday. Not sure how long they’ve been out, probably a while for all I know. Admittedly, I did not buy them nor will I try them. I just can’t imagine that they taste anything near edible. And certainly nowhere near anything like biscuits and gravy. Oh sure, the idea was a good one. Two great things combined into a third, fun, artery-clogging food item. But the end product is what I’m not so sure about. I mean, this is the same group that threw together Chicken and Waffles Chips and look what that got us. Yuck. That’s what it got us. A whole lotta yuck. This entry was posted in Everyday Musings and tagged biscuits and gravy, biscuits and gravy chips, chicken and waffles chips, eating, food, fun, humor, just for fun, life. Bookmark the permalink. They are offering Greektown Gyro flavored in my area. Oh no! Really!? Have you tried them? If I see them I will have to buy them. ummmmm, I’ll wait until it’s cold out withe that “S” stuff all over the place and make the real thing. My Mom makes the best in my humble opinion and always from scratch. She learned from the best (her grandmother, whom I’ve spoken of her here before, Grandma Mooney). Although she keeps the secret to herself which pisses me off. I think it’s one of those “there’s no real recipe to it” kind of things and even though I watch intently when she does it, I can never recreate it at home…neither the biscuits or the gravy. Her cornbread either…which is to die for. She makes it soooo good too. Dang. Now I’m hungry! I gotta try these. They had a Garlic Cheese Bread flavor a couple years ago that were delicious. I’ll take your word for it. 😀 Come back and let me know what you think if you do end up trying them! Ranch and BBQ flavored is about as far as I go with chips anymore. I’ve tried other flavors much to my regret. I’ll try once, but I wont promise anything,lol…I’ve tried chocolate Vegemite, I have never wanted to throw up so much in my life before! The picture on the pack looks disgusting! I won’t be trying them either. They’ve been coming up with all kinds of flavors and having a contest as to which one people like the best. Whichever flavor wins, the person who came up with the idea wins a million dollars I think. Not a bad way to make a buck. but the stuff has to be good not like this though. Ooooooh boy….. what a concept !!!!!! I know…I just don’t think it’s a good one. But I know some people who enjoy flavored chips like this. My son is one of them. It’s either Made-From-Scratch or it’s just another “Automation” style. What the heck was wrong with regular old Lays potato chips? You mess around with your brand enough and you start scaring people away. 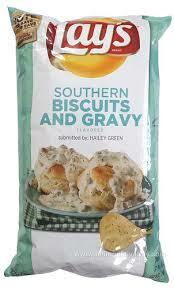 If I want the flavor of biscuits and gravy or Greek gyros, I’ll go buy biscuits and gravy or Greek gyros. A WHOLE LOT OF YUCK….THEY ARE NOW ON SALE FOR A REDUCED PRICE MOST PLACES. I’ve never seen the pickle chips one. But I do like BBQ. Aside from the fact that I’m trying hard to eat healthier, the only chips I’ve ever been a fan of are plain potato chips, Fritos, or tortilla chips with salsa. All of the different ranch, BBQ, onion, and myriad other flavors can sit on the shelves and rot. Although I might buy a case of “Rainbow Doritos” just to piss off the weapons-grade idiotic homophobes on general principles! I might buy the Rainbow Doritos, but I wouldn’t eat them. I’d just post photos to anger the mobs (as per your suggestion mind you). LOL I hate Doritos. Yes, I’m not going near those, Wendy. Just get the biscuits, you know? Yum. Pass the bacon, please and thank you, Wendy.